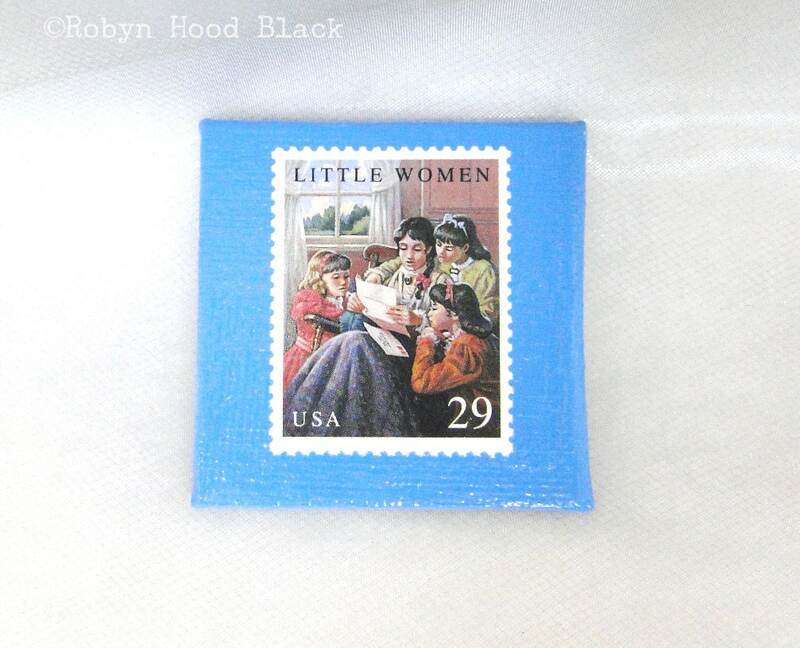 The vintage US Postage Stamp on this magnet features a depiction of LITTLE WOMEN by Louisa May Alcott, first published in two volumes in 1868 and 1869. The stamp is part of a series of Children's Classics issued in October of 1993 (Scott #2785-88), four 29-cent stamps honoring classic books for young readers. The 2" by 2" canvas square board is painted king's blue, then collaged with the authentic vintage stamp. A shiny acrylic gloss layer covers all, and a 1/2-inch magnetic disc assures your check-out list from the library will stay on the fridge. Note: Sometimes the canvas boards have slight variations; each magnet is made by hand. This listing is for one magnet. Packaged in a clear, archival sleeve. Is your purchase a gift? I'm happy to wrap free of charge. Indicate the shipping address, if different from your own, when you place the order. If you'd like a handcrafted To/From tag, please list the names in your Note from Buyer. Check out my blog for creative types at http://www.artsyletters.com, and the artsyletters facebook page! It’s perfect! Love it! Thank you so much I’m sure I’ll be ordering from you again! I accept payment via PayPal or by credit card directly through Etsy. (Payment is expected at time of order.) South Carolina residents will be charged state sales tax, as will residents of some other states per their own policies. RETURNS: I hope you love your purchase! If you are not satisfied, please contact me through the Etsy Conversations system within seven (7) days of your receipt of the work. You may ship the item in its original condition back to me at your expense and request an exchange of an item of equal or lesser value, which I'll ship free of charge upon receipt of the returned item. [Do let me know if an item such as jewelry does not live up to normal care and use; I want you to feel good about your purchase and will do my best to make it right!] NOTE: I will generally not be able to offer refunds or exchanges for international orders. Please convo me with any questions or concerns. *** USA***Small packages will be shipped USPS First Class mail (includes tracking number). I use USPS Priority Mail for most other packages within the US, with tracking and insurance. In some cases I might use UPS or FedEx. I generally ship orders within two (2) business days of receipt of payment, but PLEASE check shop announcement for travel/shipping info if shipping time is a concern. ***Expedited shipping usually available at buyer’s expense. Please convo me to arrange. ***I carefully pack each order, using new or gently used packaging materials. If your package arrives damaged, please photograph the damage and contact me within three (3) days of receipt of package about how we can resolve the issue through the carrier. ***INTERNATIONAL CUSTOMERS*** For international orders, I typically use USPS First Class International Rate. Tracking is included for some countries but unfortunately not for all. Customers will be responsible for any customs fees, taxes, duties, etc. (These costs are out of Etsy sellers' control.) I print all my shipping labels through Etsy; international labels are automatically marked as merchandise and include the price of the item(s) as stated value. According to the US Post Office, international packages typically take between one and three weeks to arrive, but time may vary by country. Feel free to convo me with any questions. ***All artwork, reproductions and images on artsyletters.etsy.com are copyright © Robyn Hood Black. All rights reserved. ***Please note that for works printed by hand, some slight variations might occur between prints in an edition, and regarding color, some variations occur between computer monitors. For altered page collages, vintage items included often show their character with nicks and knocks. I often use vintage frames for these projects as well. ***Gift Wrapping offered free of charge! ***Please visit my blog at http://www.artsyletters.com, and Friend artsyletters on Facebook!